Do you ever wonder how a certain street in the French Quarter came to bear its name? And what the stories are behind the shutters of this Creole cottage, or that storefront? Take Toulouse Street, for example. Its French Quarter portion stretches only for seven blocks, from the Mississippi River to N. Rampart Street, but it represents the city’s storied past perfectly. There are centuries-old buildings, street-name wall tiles left from Spanish rule, the name of the street itself (left from the French rule), and — if you peek through wrought-iron fences or go down some narrow passageways — lots of lush courtyards and architectural details to explore. Toulouse Street also represents the modern French Quarter well, taking on the character of its cross streets. For example, you’ll notice no less than six art galleries and stores clustered close to where it intersects with Royal Street, and six bars and clubs pepper the intersection of Bourbon and Toulouse alone. Let’s walk the seven blocks of Toulouse Street, from the river to the end of the French Quarter marked by N. Rampart, and see what we find. But first, a bit of history: What’s in the name? 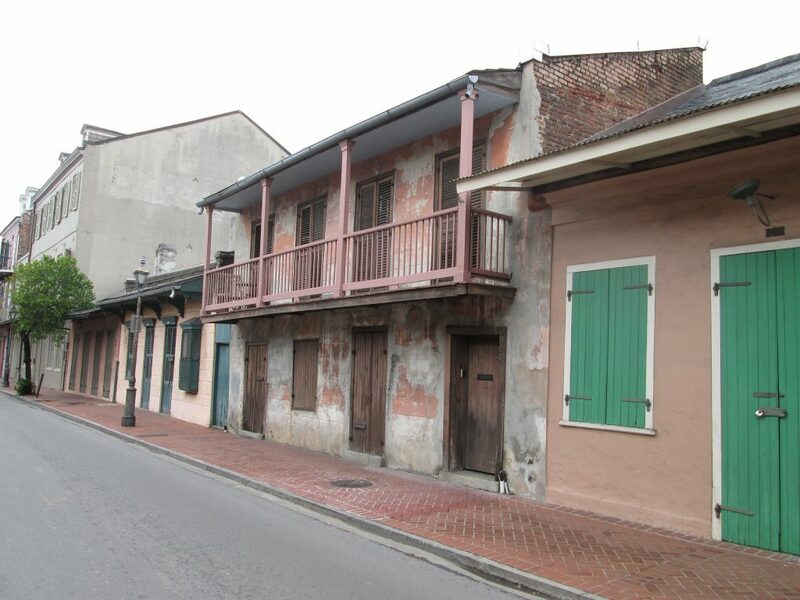 Toulouse Street, between St. Peter and St. Louis streets, dates back to 1721. It was named after Louis Alexandre de Bourbon, Count of Toulouse since 1681 and grand admiral of France. He was a legitimated son of Louis XIV and Francoise-Athenaïs, marquise de Montespan. Toulouse Street is numbered from the river, with 100 numbers allocated for each block. So if you see the building numbered, say, 540, it means that it’s located five blocks from the river. Like all streets running parallel to Canal Street, Toulouse has even numbers on the left side and odd on the right. Starting at the river, you will first see the Toulouse Street Wharf (1350 Port of New Orleans Place). Still an active port, the wharf weekly receives cruise ships from companies like Carnival Cruise Line and Norwegian Cruise Line International. Right next to the wharf is the docking place for the Steamboat Natchez, where you can board this classic riverboat for the daily dinner and sightseeing jazz cruises. Approximately 30 minutes before departure, you can hear its Steam Calliope, a 32-note steam pipe organ, being played. It’s one of the unmistakably unique sounds of the French Quarter, and you can hear it far and wide beyond the wharf. Moving away from the riverfront, you’ll see a multi-storied mall located in a converted brewery, The Shops at Jax Brewery (600 Decatur St.). Several floors hold retail stores, cafes, restaurants, and a small museum dedicated to the brewery (free admission). Check out the view of the river from the patio of Jackson Brewery Bistro Bar, or get some beignets at Cafe Beignet. Across the street, Cafe Maspero (601 Decatur St.) has been serving Creole and Cajun classics since 1971. Specialties include veggie muffaletta, Creole Jambalaya, and the heaping seafood platters. The always-open enormous windows provide a great view of the busy corner — a prime spot for people-watching. Next, you’ll be walking past the now-vacant building that is rumored to be turning into condos. The 12,000 square feet space on the first floor was occupied by seafood restaurant Ralph and Kacoo’s. This location closed in 2014 after 40 years. Across the street, New Orleans Creole Cookery (508 Toulouse St.) of the Tusa family serves a traditional Creole menu featuring lots of boiled seafood, and Creole and Cajun versions of gumbo. The full bar features hurricanes (listed by strength category 1-5, $8-15) and other signature drinks like bacon Bloody Mary. Summer happy hour serves up 50-cent raw oysters and $1 charbroiled (some of the best we’ve tasted in the city!). Next, you’ll encounter two smoke shops, Happy Hookah (511 Toulouse St.) and La Habana Hemingway Cigar Bar (533 Toulouse St.), which is a full bar with extensive scotch offerings. Three restaurants are next as you approach Charters Street. Chartres House (601 Chartres St.) offers Cajun seafood platters and New Orleans favorites like Cajun jambalaya and crawfish etouffee. Try their specialties: crawfish cakes and Toulouse oyster salad. Golden Chips (537 Toulouse St.) is a small takeout space that specializes in two things only: Belgian style fries (double-fried) and Louisiana-style chicken tenders. Those are served in a cone with a choice of seven house-made sauces like aioli and samurai (mayo-based, with Tabasco). The Grill (540 Chartres St.) is a sister restaurant of its flagship Riverbend location, Camellia Grill. It’s also popular for breakfast and brunch, and serves American diner staples like omelets and chili. On the way to the gallery haven of the intersection of Royal Street, there are two boutiques: The sassy Sweet Pea and Tulip (SPT) Boutique (610 Toulouse, with another French Quarter location on Chartres) has novelty tees, kitchenware, party accessories, and books; and the dog-centric Southern Paws pet boutique (633 Toulouse St.) specializes in treats, organic food, and grooming products. Then, it’s on to the galleries and art shops with Roux Royale (600 Royal St.), Elliott Art Gallery (540 Royal St.), Toulouse Royale (601 Royal St.), Glass Magick (713 Toulouse St.), and New Orleans Silversmiths (600 Chartres St.). Roux Royale is a gift shop that sells New Orleans-centric kitchenware and cookbooks. Toulouse Royale also sells all things Louisiana, like souvenirs, sauces and clothing. New Orleans Silversmiths specializes in estate jewelry and antique tableware. An important landmark on the 600 block is One Eyed Jack’s (615 Toulouse St.), a famed performance venue with three rooms and a luscious, dimly lit interior. It’s a must destination if you want to see some local music, dance to a DJ, or catch a burlesque show. Walking toward Bourbon, you’ll be passing by a historic building at 722 Toulouse St. marked the “Williams Residence.” This was one of the apartments Tennessee Williams had rented after arriving in New Orleans in 1938. It is said to have served as the setting for his play from the late 1970s, Vieux Carre. The building now belongs to The Historic New Orleans Collection. The property at 718 Toulouse also belongs to the Collection’s founders, General L. Kemper and Leila Hardie Moore Williams, and is open for tours ($5). There are six bars and clubs on and around the intersection of Bourbon and Toulouse. The name of Toulouse Dive Bar (738 Toulouse St.), right off Bourbon, speaks for itself. Next to it is Molly’s Bar (732 Toulouse St.), which used to have the same owners as Molly’s at the Market. Molly’s Bar is also low-key and dark, with a jukebox and pool table. There’s Guinness on tap, plus the well-advertised Irish car bombs and Jell-O shots. Right next to Molly’s is the alley passageway to The Dungeon, a very late-night rocker/biker club with heavy metal on the jukebox and a roster of famous musicians who have been guests since it opened in 1969. Three clubs flank the intersection of Bourbon and Toulouse. Tropical Isle (600 Bourbon St.) epitomizes the rowdy street scene with loud music, big-screen TVs, and their specialty drink the Hand Grenade. This is one of its several locations on Bourbon Street, and there’s a merch shop next door. Nightclubs Old Opera House (601 Bourbon St.) and Funky 544 (544 Bourbon St.) complete the party vibe. After that, Toulouse Street takes it down several notches with two mostly residential blocks between Dauphine and N. Rampart, with swaths of properties listed for sale (“Not Haunted!” notes the sign outside number 927). According to the statistics through the end of May of this year, French Quarter home values have gone up 7.5% over the past year. The median home value is $528,600 and the median list price per square foot in French Quarter is $575. Trulia cites the average listing price at $744,225, and median rent per month at $2,900. Before we hit the end of the street, take a look at the historic Campanel Cottage at 901 Toulouse, which now houses the New Orleans Jazz & Heritage Foundation Archive (open for research by appointment only). 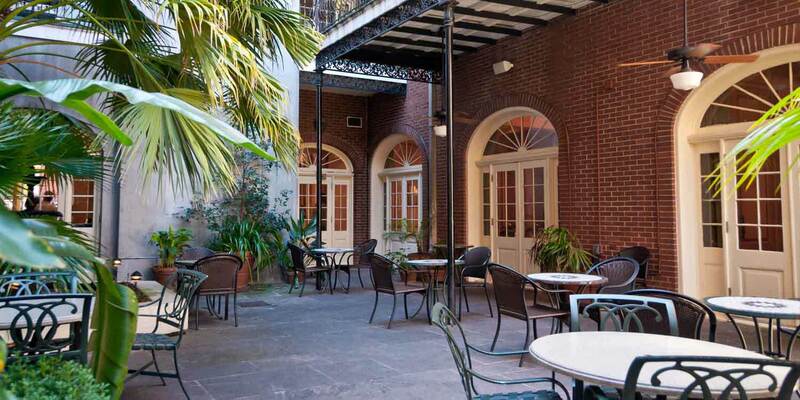 And, if you peek inside the historic building of Hotel St. Marie (827 Toulouse St.), you’ll see a beautiful courtyard and pool. 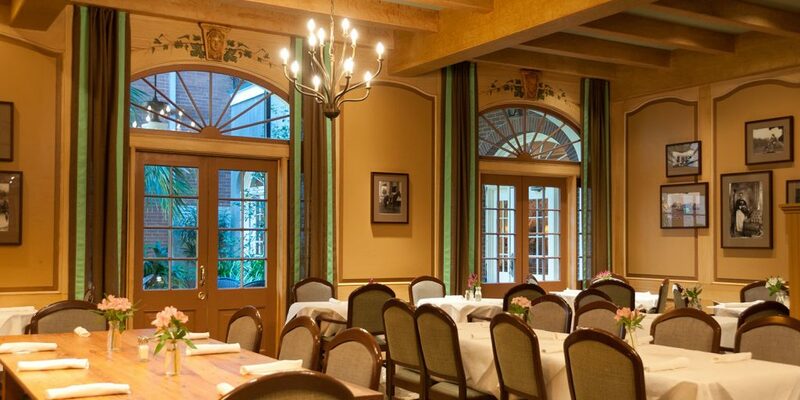 The hotel’s Vacherie Restaurant is named after the small town of Louisiana where chef Jarred Zeringue grew up. The restaurant focuses on homestyle, inventive Cajun and regional Louisiana fare. There is a brunch on weekends with a DYI Bloody Mary bar, and the happy hour bar menu is only $5: chicken wings, gator sausage, sliders; with mojitos and beers flights to drink. Finally, when you reach the corner of Toulouse Street and N. Rampart, you’ll be looking at the Louis Armstrong Park across the street and the beginning of the Treme. Legendary seafood wholesaler P&J Oyster Company (1039 Toulouse St.) and gay bar/nightclub called The Page Bar at 542 N. Rampart St. complete the tour.